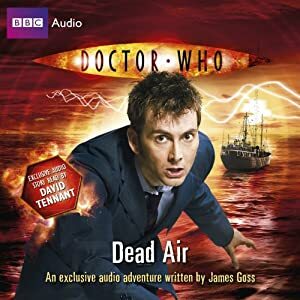 The Doctor Who Audiobook Dead Air has been named the 2010 Audiobook of the Year. Written by James Goss and read by David Tennant the story was the seventh and final exclusive-to-audio adventure to feature the Tenth Doctor. The award was selected by voters visiting the Audiobook store. It beat other books nominated including Adrian Mole, The Prostrate Years, Othello, Animal Farm, Shakespeare in Love and War Horse. James Goss told the Doctor Who News Page he wished to thank all the fans who voted for the story. I'm absolutely thrilled that Doctor Who: Dead Air has won - it's an amazing reading by David Tennant, and I'm really chuffed that it's gone down as well as it has, not just with Doctor Who fans but with the public as well. This is a gratifying achievement which pays tribute to the combined talents of writer James Goss, reader David Tennant, and the AudioGO production team who created a multi-layered adventure for the Doctor combining voice, music and atmospheric special sound. The winner was announced at 5pm on Saturday 18th September, at Chiswick Book Festival.